The C.K Tools Cable Cutter is a must have accessory for both Electricians and DIY enthusiasts for cutting cable in an efficient and effortless manner. Manufactured from a special drop forged high quality alloy steel construction with razor sharp, induction hardened Cutting edges for outstanding, efficient and long term cutting performance. Special profile blade for effective cable cutting & wire stripping. Hardened cutting edges for outstanding cutting performance. Bought this for my husband who is an electrician, he loves them and wouldn't do without these being in his tool bag anymore! hey, i would like to know what size i should buy, the biggest cable i will cut is 10mm twin and earth domestic cable. Electrical World Replies: Any of these will do your job, the bigger pair - 240mm will mean you dont have to press as hard to cut through cables. 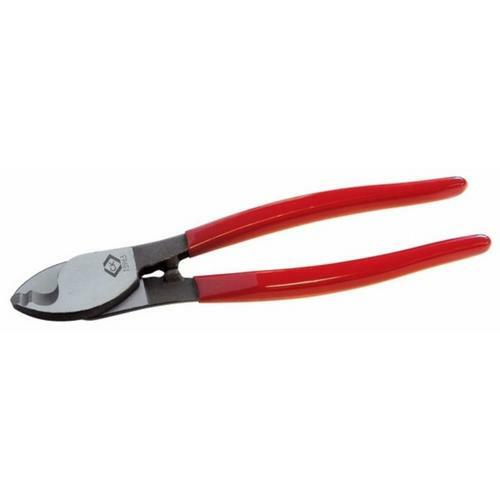 These are very sharp so even the smaller pair - 160mm will make light work of cutting cable. I need a pair of wire cutters to get a light weight wire bike lock (which came with a cycling magazine, so not an expensive one) off the bike as I have lost the key. The wire is not more than 5m.m. max. Will this do the job ? can i use these to cut SWA cable? Electrical World Replies: Hi, Yes you can is the quick answer but to provide a little more information... I have used these to cut 1.5mm and 2.5mm swa in the past myself and they cut it pretty easily (I was using the 240mm version). The only thing to mention is the bigger and harder to cut the cable is im sure it would wear your cutters down that little bit faster.